A Resistance Soldering Unit (RSU) is an instrument for soldering based upon sending a limited current through the items to solder. The method looks remotely like electric welding but in a welding unit the heat is generated by the arc that is maintained as long as the probe is in contact with the workpiece. With welding the material of the workpiece itself reaches melting temperature. With an RSU the current and temperatures are not allowed to reach such heights. There are various methods to reach this goal. But the most widespread and easiest is to use a carbon rod as probe. The carbon rod has relative high resistance and thus limits the current. As the carbon rod heats up fast to red hot it will also act as heatsource. The initial current is dependent on the contact between the surfaces to solder. The resistance here is directly used to generate heat to melt any solder directly on the spot where you want it. What is good compared to a normal soldering iron? Well the major difference is that the workpiece is heated much more locally in a very short time period. 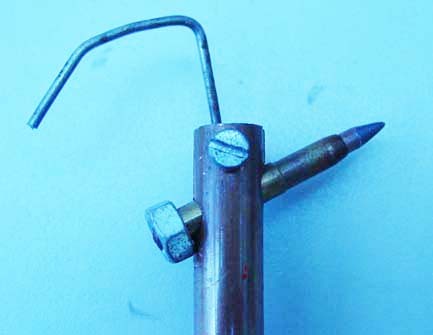 This enables you to solder small things on large objects without heating up the whole of the large object. But also you have more accuracy in position control because of the use of a footswitch to switch the power on only after items are placed correctly in cold position pressed down with the probe. With an iron small things get very easily displaced. 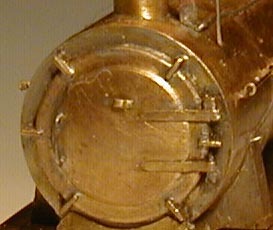 Constructions like this smokebox door with many small parts are much easier to produce with a RSU compared to any other soldering method I know. As with any tool there are some drawbacks if not properly used. If you lift the probe with the footswitch still pressed you generally create a spark that damages the surface of your workpiece a little. You can burn a hole in your workpiece if you use a too high power setting on a tiny workpiece. If it is really small than it simply evaporates into thin air. This is a sketch with the schematics of my unit. I used some very useful junk components that I could lay my hands on and completed it with new items such as the large 200W transformer There is nothing real special but note that I used a variac or variable transformer in the first step. There is also a controlled mains outlet and the usual on/off switch, indicator lamp. The controlled mains outlet can be handy to plug in your normal iron when you want to lower the temperature for low melt soldering of white metal and such. The footswitchs controls the power to the probe. The transformer needs to give a lot of amperes and but not too much voltage say 6-10 V and 30-20 A giving about 200W maximum suffices. If the voltage is too high the risk of sparking increases and this leads to ruined models. The use of a variac enables a stepless control of the unit. However when new these things are very expensive(~100 Euro). To try to use a light dimmer instead for an inductive load that a transformer is is generally not a very good idea. A cheaper alternative is to use a transformer with several secondary windings giving you step wise control. The following sketch gives an idea of an alternative. I tend to think that 3-4 steps would be entirely sufficient, say using 120W, 150W and full range. Note however that in all cases you need to use a good and safe separation between the primary and secundary coils of your transformer. Thus only use equipment that you can trust to be fully safe, you are touching the workpiece and probe all the time when they are around at your workbench. Which is one of the reasons that I purchased an entirely new transformer for my RSU, well spend money for your own safety. You see an unattractive but jolly good piece of old laboratory instrument in its second life with some new plugs and entirely new wiring inside. The red thing in front is the footswitch, that plugs into the europlug between the on/off switch and the lamp. The 2 black banana plugs are for the probe. A fresh piece of copperclad carbon rod for probes is lying between case and footswitch. This is how the probe looks. Piece of copper tube with the carbon rod at angle. The carbon rod is clamped with the M6 nut. The hook is for hanging it out of the way somewhere at the edge of the workbench. The probe is connected with 4 mm copper wire from the car shop that directly plugs into the banana plug. Use thick wires suited for high currents here because you don't want to add any resistance from the leads in the circuit. The base plate is a normal blank aluminium cooling unit for electronics. Other people use steel plates and magnets to clamp workpieces. Sometimes the steel plate is covered with alu household foil. Oh one thing: better don't make a straight probe as you see some vendors trying to sell, that is a disaster design for fiNe-SCALE work as your probe needs to be perpendicular to the work but working with your hands in the air without support is not good for proper work.